On 12 May 1978 at 7.12pm, the Dutch broadcaster TROS broadcast a 20 minute Kate Bush television special, recorded at the Dutch amusement park Efteling. On 10 May 1978, Efteling was ready to open the Haunted Castle, the most expensive attraction it had ever constructed, and they wanted to promote it as much as they could. Ton van der Ven, who designed the castle, appeared in a popular talk show and in April a documentary featuring the Haunted Castle was made by filmmaker Rien van Wijk, who was eager to shoot in the latest attraction before it officially opened. Kate, who just had a big hit with Wuthering Heights, was approached for a television special that would promote both Efteling and her songs. The special was filmed in April, a month before the official opening of the castle. Moving was filmed on the square in front of the castle. Wuthering Heights has Kate dancing around inside the main show of the castle. A smoke machine is used for added effect. 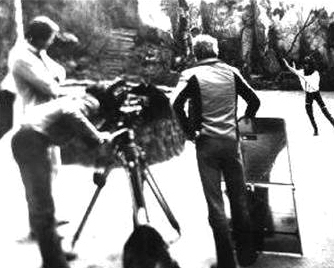 Them heavy people was filmed on three locations: inside the main show in the attic; at the entrance of the main show with the oriental ghost; and outside before the entrance of the cave which is part of another attraction, the Indian Waterlillies. The Kick Inside was filmed on the lake, with Kate lying in a death-barge. At the end of the song, she sails slowly down a placid river, evoking images of Elaine and The Lady of Shalott, classic poetical figures of Arthurian legend. The special starts with a tombstone bearing the name Kate Bush. 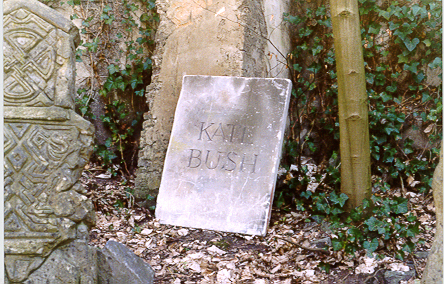 This tombstone was the subject of a lot of speculation among Dutch Kate Bush fans, since it disappeared from view between 1978 and 2003. The tombstone suddenly resurfaced in 2003 at the 25th anniversary of the Haunted Castle, and stood there at the entrance. Since 2007 the tombstone can be seen in the catacombs of the main show in the castle. Light designer Bert Klos recounted about the recording of the special in 2014. "They were very heady days. There were so many different locations and I wanted to support the actions of Bush as well as possible with light. She was a short woman with a thin voice, but very professional. That woman couldn't be stopped, she just kept on going. When we wanted to sit down for a while, she already stood up and said: 'come on guys!'. I can even recall a soundman tripping across his own feet from sleep at 1am!" Henk Gulikers, who did camera during these days, recalled: "We didn't sleep until 3am and at 6.30am we were back around the table with Kate and a cup of tea. We stayed in Hotel De Swaen in Oisterwijk. I got an LP from her, on which she'd written: 'For dear Henk, the one who is very much alive behind the dead camera.' Very nice, I liked that. Apparently she felt very much at ease." Kate Bush at the Efteling: The 1978 Dutch tv special. Retrieved 22 October 2014. The Efteling special. Retrieved 22 October 2014. Kate Bush-special. Eftepedia, retrieved 23 October 2014. Kate Bush 36 jaar na legendarisch Efteling-optreden terug op podium: 'Ze was niet te stoppen' [Kate Bush back on stage 36 years after legendary performance in the Efteling: 'She was unstoppable]. Omroep Brabant website, retrieved 22 October 2014. Some Edited Highlights From Her New Album "Never For Ever"